Philander Wiseheart lived at home with his parents, assisting on the farm in Summer and going to school in Winter, until the beginning of the Civil War, when he immediately offered his services to his country, enlisting in what became CompanyB, 8th Indiana Infantry (three months) and was mustered into the service of the United States, as a private, April 25, 1861. In the battle of Rich Mountain, West Virginia, July 11, 1861 he was killed, being the first soldier from Henry County to lose his life in the Civil War. His remains were buried on the battlefield and the grave marked by his comrades, in such a permanent way, that it could be identified when the time came for the government to undertake the gathering of its dead soldiers from the scattered battlefields of the war and the placing of them in National Cemeteries. 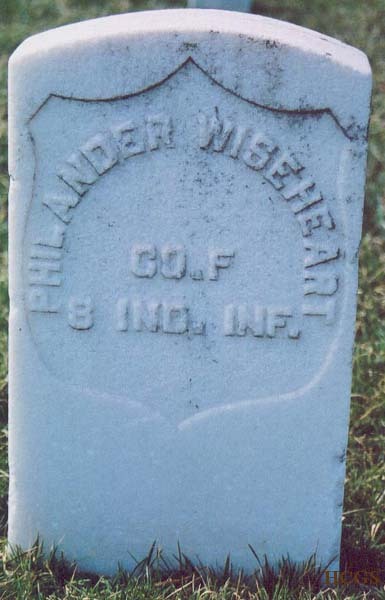 To this is owing to the fact that the remains of Philander Wiseheart have been re-interred with reverent care in grave number 655, in the National Cemetery at Grafton, West Virginia (See photo). He was an exemplary young man, highly respected and gave promise of a long and useful life. Alas! Cut down in the flush of early manhood, in the titanic struggle of the Civil War. It has always been attested by his surviving comrades-in-arm that he was an ideal soldier, patient in camp, enduring on the march and brave in battle.